With its poor record in fighting crime CCTV is struggling to justify its huge cost and attack on civil liberties, but will offering members of the public money to spot video wrong-doing help improve its effectiveness? The UK’s vast network of over 4 million CCTV cameras has been heavily criticised for failing to warrant its huge drain on public expense. A recent report into London’s surveillance system claims that during the previous year only one crime had been solved for every 1,000 of the capitol’s CCTV cameras. It is also argued that beyond the billions of pounds spent on the technology, CCTV comes at the expense of civil liberties but with little payback in the form of improved security. Why is CCTV not proving to be as effective as promised? 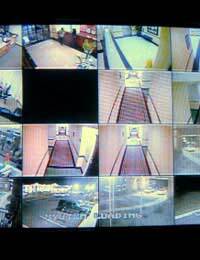 Is video surveillance ultimately limited in its effectiveness or is it just not being used to its full potential? Some believe that the network is failing because the footage is not being adequately monitored in real time but only referred back to, once a serious crime has been committed. It is an attitude that has helped eradicate the fear of CCTV and the technology’s power as a deterrent. It also inspired a scheme launched in 2010 by a private company in which members of the public assume the role of the CCTV monitoring staff. Scanning commercial CCTV footage streamed online, they report any suspicious activity such as shoplifting in exchange for cash rewards. Having paid an annual subscription fee, participants are given four simultaneous screens to scan taken from cameras installed in random shops and other businesses that have chosen to take part in the programme. If the viewer spots anything untoward they are able to press an 'alert' button that sends an instant text message with accompanying image to a nominated shop assistant or manager. The business can then decide whether to confront any suspected wrongdoer or call security. If any misdemeanours are spotted, subscribers are eligible for a share in a reward pot of up to £1,000. On its launch the scheme was promoted as helping to reduce crime and prevent other anti-social behaviour by acting both as an effective security monitor and deterrent. At a time of newly announced budget cuts and with the Conservative Party’s ‘Big Society’ initiative, which encouraged citizens to get more involved in running their local services, still fresh in the mind, the scheme was even hailed as one way people could help out local communities. Conversely, some argued that, rather than contribute to society, people that watch the world through a monitor and report on the people they see on the screen are less likely to be able to play an active part in the community. The scheme has also drawn fierce criticism from civil rights campaigners, who described it as “distasteful”, “Big Brother-style snooping”, and likened it to a game in that it encourages private citizens to spy on each other for cash prizes. Other critics simply condemned it as being doomed to fail, citing an inauspicious precedent in the USA. Launched in 2008, the ‘Texas Virtual Border Watch Program’ allowed anyone in the world to log on via the Internet and watch a live feed from the Texas-Mexico border to report any suspicious activity, such as smuggling. During its first year of action, the scheme produced information leading to 12 arrests and extensive reports on the movements of local wildlife – scant yield for $2 million of investment. Needless to say the programme soon ran short of money...and its backers, out of patience. Longtime Value?The failure of the US scheme could be seen to support the idea that the relative ineffectiveness of the UK’s CCTV network is not due to any inadequate monitoring but because that video surveillance itself is ineffective as a means of preventing and solving crime. But this may seem too rash a condemnation. Police have said that CCTV has proven ineffective because all the investment has been on the technology and not on how the images can be used most effectively, such as in building a national CCTV image database. Whether encouraging CCTV viewers to spot crimes with the aid of cash incentives will also improve its effectiveness remains to be seen.